Your picture appears and on the right all the tools available. Quick Fixes include automatic processes that can instantly enhance your image. All the other options are self explaining. Over your picture you can see three tabs that allow you to change which image is displayed (before retouching or after or both at the same time to compare the improvements). You can change the zooming factor using the buttons below the picture and quicly rotate it. The next button allows you to open the image in the first Image Editor you configured. When you switch to Red Eye a selection rectangle appears over the picture. You should move it and adjust the handles to surrender one or several red eyes in the pictures (fixing one eye after the other generally brings better results). Once you have positionned the rectangle properly click the Apply button. If after having changed the zoom factor or having moved the image you do not see the rectangle anymore click the Show Selection button to put it back at the center of the view. Switching to crop also shows a rectangle that you also have to move around the picture to designate the part of the image you want to keep. If you are cropping your images to print them, you can choose one of the aspect ratios listed to make sure the crop rectangle matches the print aspect ratio. 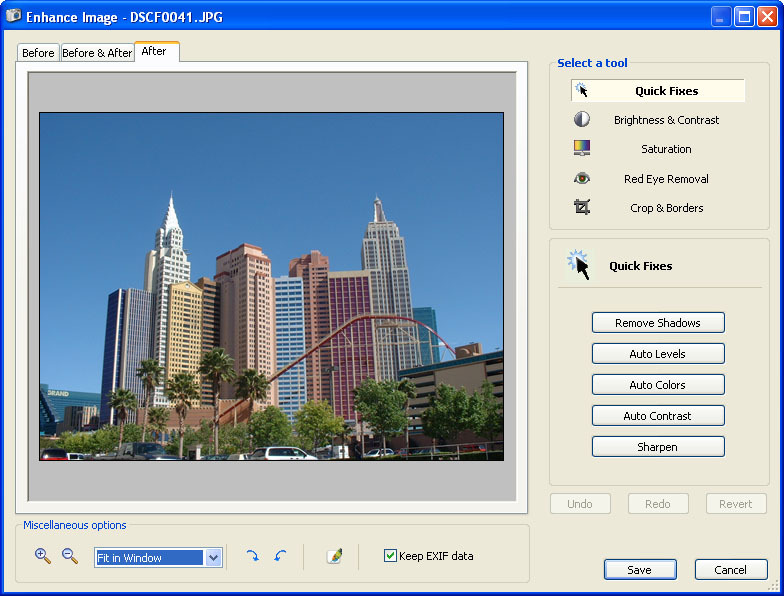 JPEG images can be losslessly cropped: cam2pc does not have to recompress the JPEG image to crop it. Of course this is possible if the only operation you performed while enhancing your image is a crop. But to perform this, the rectangle must match certain constraints. Check the lossless cropping box to make sure the rectangle satisfies these constraints. In that case the rectangle used to perform the crop might not exactly be the one you designated.